I wasn’t sure whether Gabriel was too young to bake or not, but I thought we’d give it a go- the worst thing that could happen was I’d end up finishing the project off, and I love baking so it really couldn’t end up being that problematic! 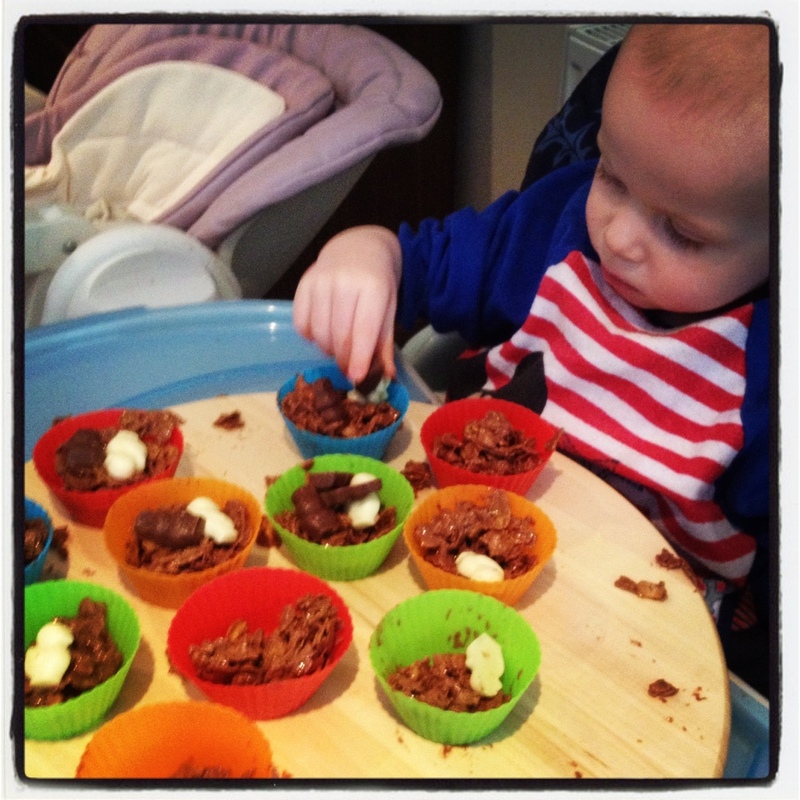 I thought the best thing to do was to keep things simple for our first baking session, and seen as it’s almost Easter- it’s an ideal time to make chocolate crispy buns topped with Easter treats. 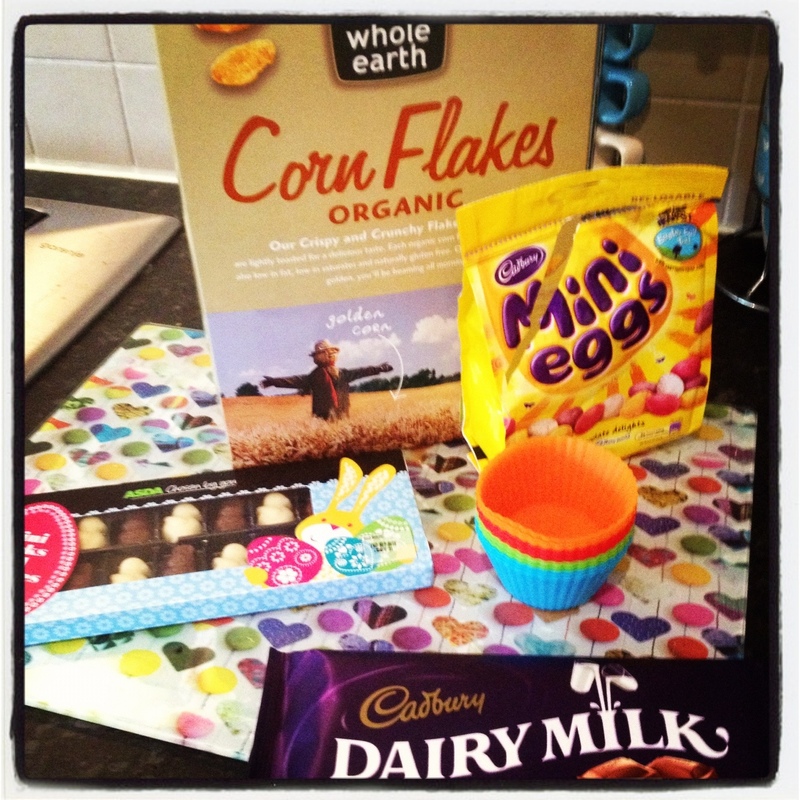 I bought chocolate, corn flakes, mini chocolate bunnies and chocolate eggs for the crispy buns. I know there are recipes out there with other added ingredients, but personally I think it’s best (and much less sickly) to keep things simple, especially with a young toddler. 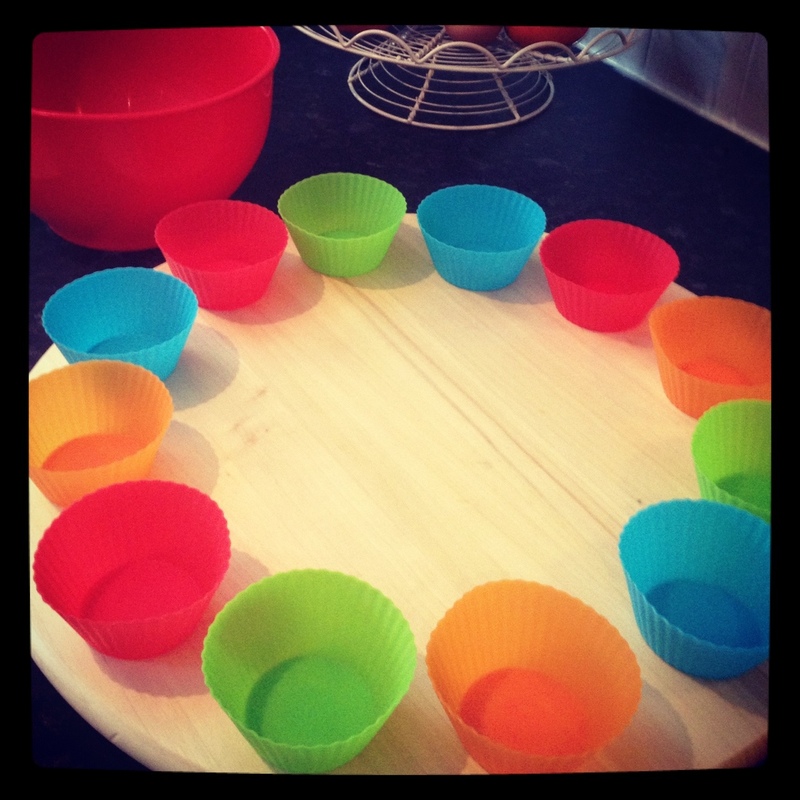 Whilst out shopping I came across some silicone bun cases, I bought them to use for this project because I thought they would be slightly more durable for a heavy handed toddler to use and also easier to eat from, for everybody. 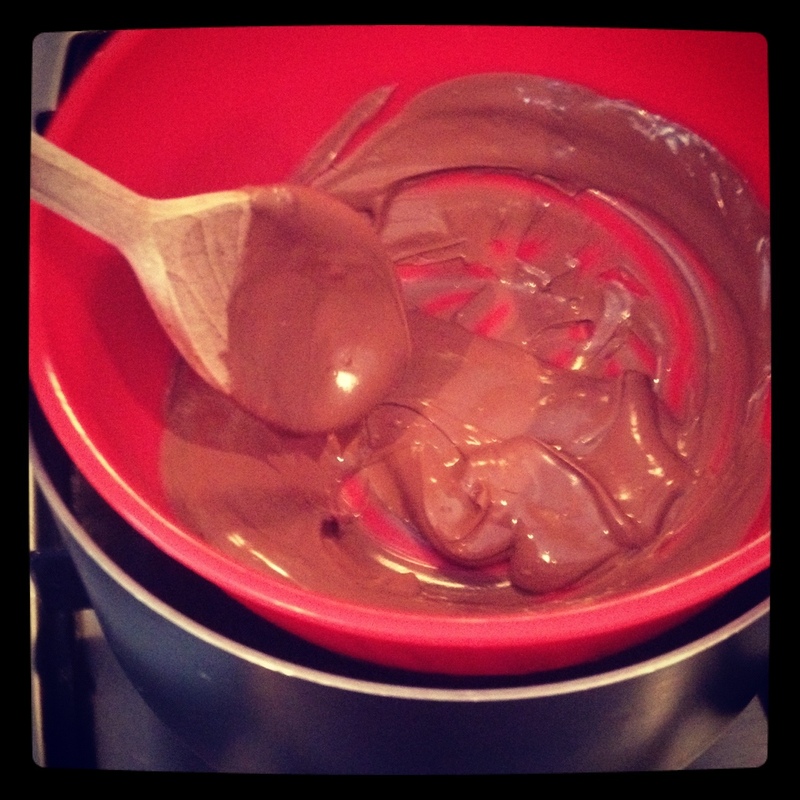 Gabriel and I broke the chocolate into small chunks using our hands, then I melted the chocolate using a bain marie method. (A bowl over hot water) I had sat Gabriel in his highchair with the bowl of cornflakes and the bun cases while I did this to avoid any accidents near the hot liquids. 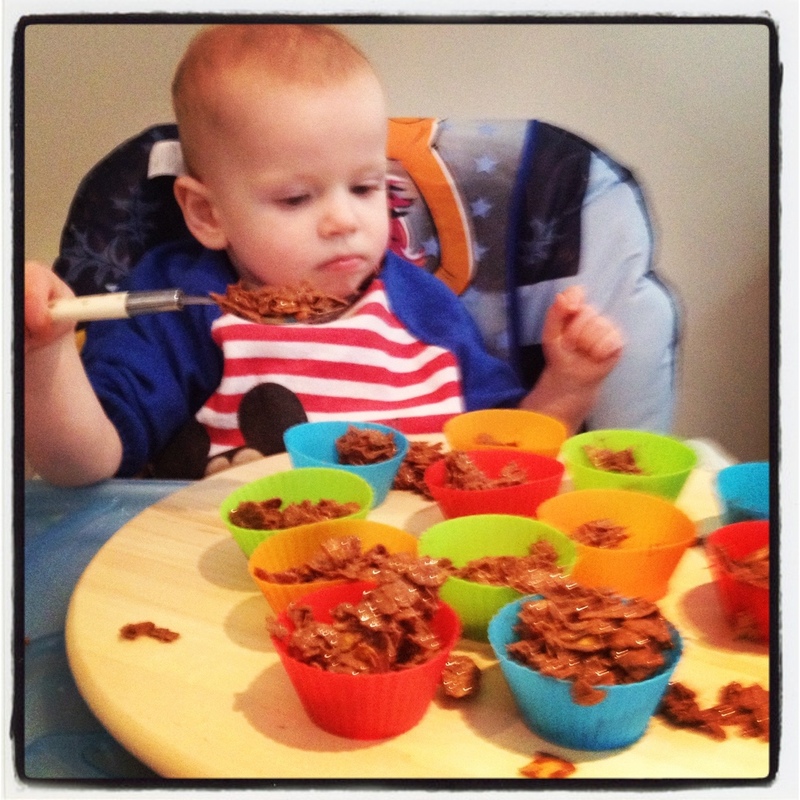 He was more than happy to entertain himself with the cornflakes! 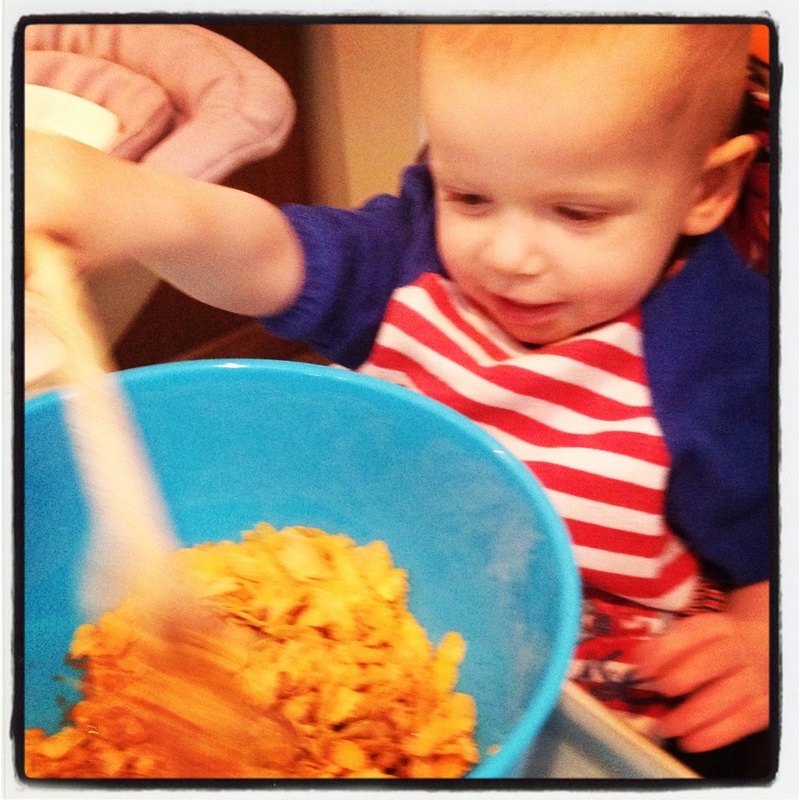 Next I added the melted chocolate to the large bowl of flakes and asked Gabriel to mix it up. He love it! 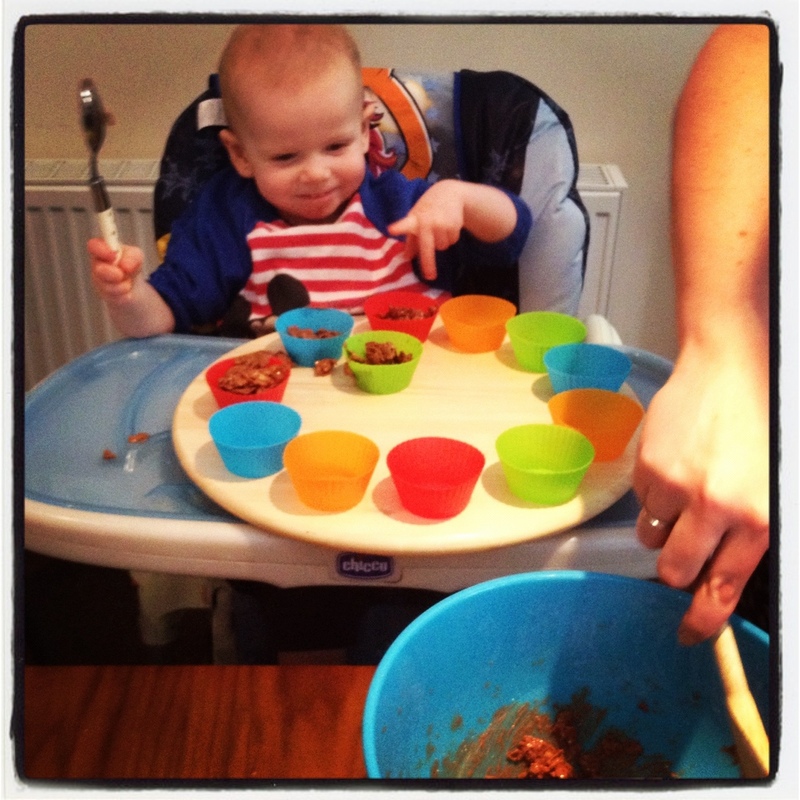 He bashed and twisted the wooden spoon through the mixture, he giggled away at the crunching sound and sang whilst he worked away at combining the ingredients. 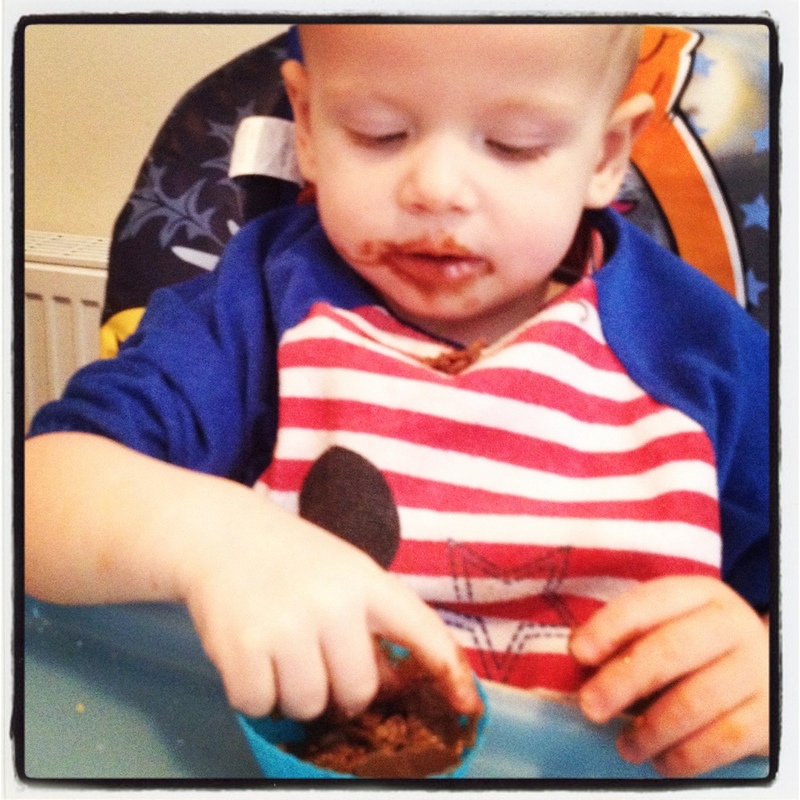 We left the mixture quite chocolatey (at Daddy’s request). I’d placed the silicone bun cases on a lazy Susan, which meant we could spin the cases round once they had been filled. The idea was a hit! Gabriel began spooning the mixture into the cases, with surprisingly little mess! He proclaimed a very proud, ‘Ta’ after filling each case and proceeded to spin the lazy Susan into its next position. I was amazed at his patience, taking care not to spill the mixture too much. We let the buns set in an airtight tin and we tucked into them a few hours later after lunch. They were delicious. I’m so glad we tried this with Gabriel, we had a lovely time. 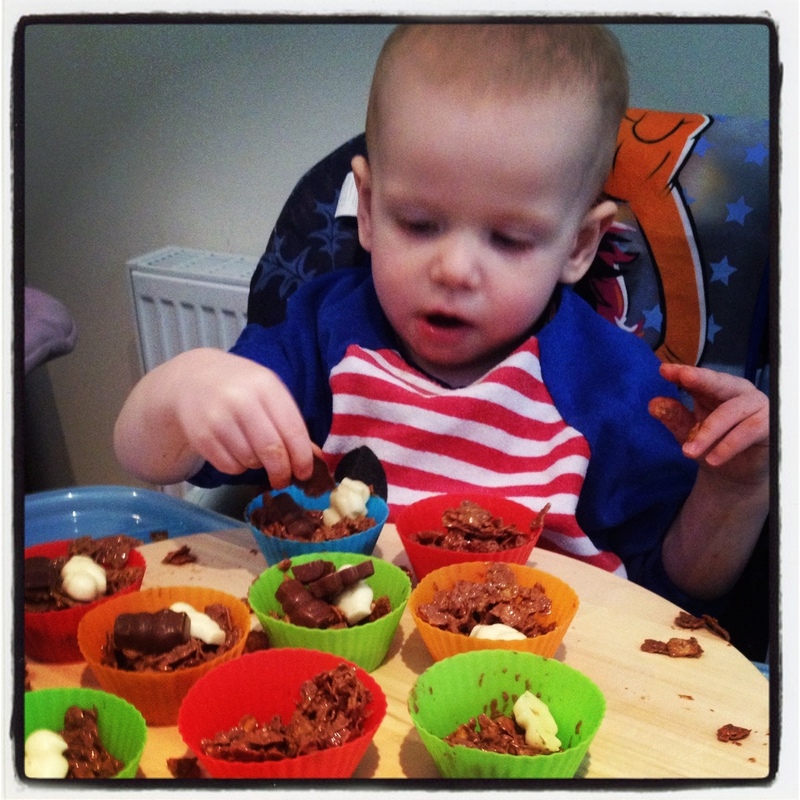 There were no problems finding people to eat them either, everyone loves chocolate crispy buns!